All good things must come to an end and that goes for our beautiful communities. 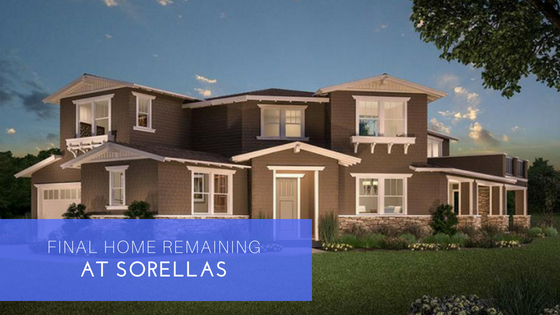 We have just one home remaining at Sorellas, our enclave of single-family homes in Los Gatos. Our final home is Residence 7 on Sisters Court. This home features 3 to 5 bedrooms, 4 baths and approximately 4,201. Ee partnered with renowned San Francisco architects Hunt Hale Jones and International design group Ryan Young Interiors to develop this spacious and beautiful home. It’s been thoughtfully designed, inside and out, to provide you with the best we have to offer. Nestled in the coveted hills of Los Gatos, secluded yet walkable to town, Sorellas is steps away from Los Gatos schools, regional hiking and biking trails, along with great dining, shopping and entertainment. The homes are situated on large lots ranging from approximated 20,000 to 38,400 sq. ft. where future residents will have wonderful spaces to enjoy the natural splendor of their beautiful community. This home is bound to sell quickly so don’t miss your final chance to own at Sorellas. Call (408) 335-8358 or email us at sorellassales@shhomes.com to schedule a tour today.